(Cefn Hirfynydd) is part of a Celtic wheel cross. 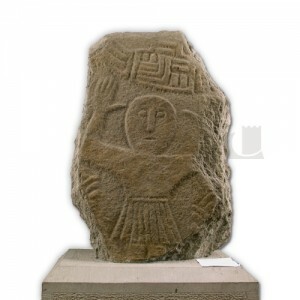 The figure is a Celtic priest with his hands raised in prayer, he wears a short pleated kilt. Above the priest is the bottom section of the wheel cross. This piece of stone is the upright shaft. The wider piece, carved with the rest of the wheel cross, has broken off at some time and is now lost. This cross was carved during the eleventh century. It represents a Christian tradition brought to Wales by monks from Ireland. Human figures carved on Celtic crosses are very unusual in Britain. We do not know where the cross originally stood, it was found on a mountain near Banwen, north of Neath, where it may have been used as a boundary marker. During the eighteenth century, Sir Humphrey Mackworth, a local industrialist moved the stone to his home, The Gnoll in Neath, where it was included in the grotto which he built in his garden.